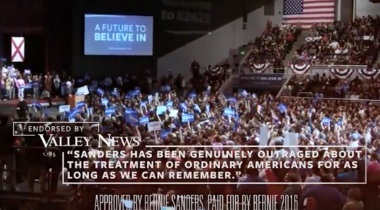 The Bernie Sanders campaign misappropriates the credibility of two New Hampshire newspapers in a new TV ad that boasts of his endorsements for the Democratic presidential nomination. The ad, titled “Endorsed,” leaves the misleading impression that the Nashua Telegraph and the Valley News endorsed him. They did not. The ad starts with a female narrator saying Sanders has received endorsements “from postal workers to nurses.” She then quotes the words of an environmental group (Friends of the Earth Action) and a progressive magazine (the Nation) that have also endorsed Sanders. On screen, the words “endorsed by” appear above the groups’ logos, and in the case of the Nation, above a boxed quote. At the end, the narrator quotes the Nashua Telegraph and the Valley News, and the quotes appear on screen in the same design as the Nation‘s endorsement (boxed quotations) but without the words “endorsed by,” an omission that viewers could easily miss. These words of praise in a TV ad about endorsements leave the impression that Sanders was endorsed by both papers. Initially, in fact, the ad debuted on YouTube and incorrectly displayed the words “endorsed by” above the quote from the Valley News, as Time magazine reported and as displayed below. In a Feb. 4 story on the Sanders campaign revising the ad before broadcasting it on TV, the Valley News said that neither paper had made an endorsement in the Democratic primary. “The earlier version of the ad was subjected to review and changed before it was broadcast,” Tad Devine told Time. The new Sanders ad is virtually identical to one the campaign ran in the final days before the Iowa caucuses, except the newspapers mentioned in that ad were Iowa papers — the Des Moines Register and the Daily Nonpareil. Although the Daily Nonpareil did endorse Sanders, the Des Moines paper did not. In fact, the Des Moines paper endorsed Clinton. Our sister organization, FlackCheck.org, included the Iowa version of the Sanders endorsement TV ad in a new video on the “patterns of deception” used by campaigns in TV ads. The Sanders campaign is repeating a pattern — first misappropriating the credibility of the Des Moines Register in Iowa and now the Nashua Telegraph and the Valley News in New Hampshire.